Should you have any tire-specific questions or would like to book tire repairs/replacement for your Kia Forte, Sorento, or Sportage, please call our Mississauga car dealership service team at 1-888-651-1987 or book online using our handy online form. Did you know that approximately 75% of roadside flats and other tire failures are caused by under-inflation? Unfortunately, it’s often tricky to tell when your tires are low on pressure. Here’s you chance to perform one of the easiest do-it-yourself car maintenance jobs that can have potentially the greatest impact on your vehicle’s fuel efficiency and driving safety. Tires, unfortunately, don’t last forever. All that friction with the road surface wears them down. Most tires last between 60,000 and 80,000 km, with some newer all season brands guaranteed by the manufacturer to last up to 100,000 km. Here’s a guide to making sure your tires have optimal traction and don’t need replacing. It’s quite surprising how much can be discovered from inspecting the type of wear on your tires. Though even tire wear is normal and expected, irregular wear patterns are often a strong indicator of problems with your suspension, steering, and wheel settings. Use this list so you can diagnose your car for possible issues before they crop up and cost you more money in the future. Since nearly all vehicles—even four-wheel drive and all-wheel drive models—send different amounts of engine torque to all four wheels, your tires will wear out at different rates if they’re not rotated regularly. 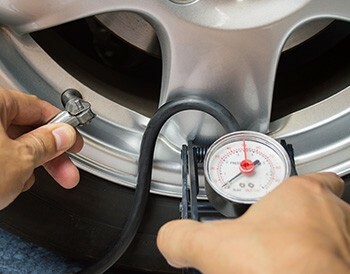 Due to tire pressure monitoring technology imbedded in your wheels (in all cars built after September 2007), plus uneven assemblies, your wheels and tires are imbalanced. To prevent a “wobble” at higher speeds, it’s essential that wheel weights be installed on your new wheels. These small weights are either stuck to the inner rim of your wheel or hammered into the edge of your rim. You probably haven’t noticed them until now. Go out and have a look! When do your tires need balancing?